The Peugeot RCZ was originally introduced in 2009 at the Frankfurt Motor Show, and immediately wowed all and sundry with its stunning roofline curves, one of the few production cars that have actually stayed true to the preceding space-age concept car. Sadly, the original RCZ was all beauty and little brain, with a frugal 1.6 engine that delighted emissions inspectors, but struggled to hit 60 under 10 seconds. From a car looking as sporty as this, that's quite a disappointment. Especially when compared with the competition of Audi TTs and VXR/ST hot hatches. However, Peugeot sensibly handed the stock car over to its race department at Peugeot Sport to inject a little more va va voom (apologies Renault), and they've come back with this, the Peugeot RCZ R.
The body shape is mainly unchanged, and the interior is straight from the hot-hatch playbook, but the engine is very much improved. Still an astonishingly small 1.6 litre, Peugeot has managed to extract a relatively head-banging 270bhp via a twin scroll turbo, strengthened conrods and considerable exhaust system ingenuity. The result is unsurprisingly rapid, especially considering that it's lighter by 17kg compared to a 200bhp RCZ, and 70BHP more powerful. The Peugeot RCZ R now hits 60 in 6 seconds and blasts onwards to a top whack of 150 mph (restricted) – figures far more in tune with the futuristic exterior design. On a sunny Brand Hatch Indy track, the Peugeot RCZ R made complete sense. With a sensation of nicely balanced weight distribution and generous road holding, it flattered our incompetent handing, and the new engine has plenty of grunt for the relatively small Brands circuit. Our instructor hosts from MSV racing now use the RCZ R as a training car (as you'll see in the video above), due to its tractable nature and predictability in corners, which is a pretty good indicator of a decent vehicle. Another area that kept Peugeot Sport busy was the brakes, which have been somewhat uprated to fixed four-piston callipers and fully floating 380mm discs all round. Although this results in considerable stopping power, the pedal can feel a little dead initially. The stock RCZ was never under-equipped, and the R version hasn't missed out either. With standard kit including Bluetooth, Peugeot Connect (RT6) audio, sat-nav, climate control, rear parking sensors, automatic wipers and xenon headlights you're only turning to the upgrades list for an upgraded sound system from JBL and front parking sensors. Inside the cockpit you're clearly in hot hatch styling territory, with a flattened base to the steering wheel, and red overstitching around the dashboard, as well as the leather on the steering wheel, the gear lever gaiter, the door trim pads, the armrests and the seats. Monogrammed sports seats in Nappa leather and Alcantara complete the picture. There are rear seats, but very much on the afterthought side, and the boot is cheeringly capacious. 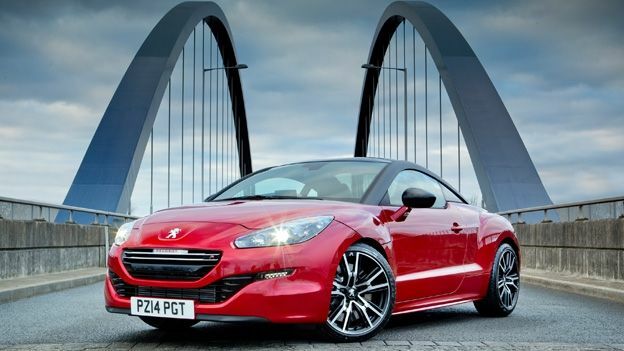 The Peugeot RCZ R is a worthy upgrade that finally delivers on the promise of the design. It's hilarious fun to drive on track, and certainly has many of the points that'll make it a contender in this category. It's not cheap, and may not hold value as well as other Audi-shaped options, but that double bubble roof is certainly something different. Tech-wise, Peugeot have done a sterling job of delivering hi-spec kit for midrange money.